Bought MP3 player: Creative Zen touch 20GB | Random Thoughts! About six month back, when I read about iPod, I wanted to own one. I said my friends, I’ll buy it if I get an onsite opprtunity. It’s time to act! Finally bought “Creative Zen Touch 20GB” from the worlds biggest marketplace. – Though Zen touch is bulky, it has 24hrs playback time compared to 12hrs in iPod! – Creative claims 97dB S/N ratio- one of the main factors in sound quality. But, Apple keeps it as a secret ( sounds fishy ??). Looks like they want to go with the hype they have got. After some googling( and with my intuition ), I felt, Creative should be as good as the iPod, if not better. – Cost is slightly less than iPod 20GB. – I like the Zen touch pad. It sounds great and I like it . But, it doesn’t include FM and voice recorder by default. After all : Idhu oru iPod kaalam! >I also have the same Creative Zen Touch 20 GB. Welcome to the Creative Zen Club. How much did u pay for it? I bought it directly from Creative and they gave the FM & Voice recorder free of charge. >hey krish… iPOD is also cool… but, u r right. if u can get one better than that, why not go for that.. btw, iPOD is a craze everywhere now.. that no one can deny..
>Therla iPod craze-a ennannu, but I love Apple products. iPod goes well with my iBook. And now iPods have 15hr battery life. I have not have *any* problem with it in the last 2 yrs I have owned it, like my iBook. More reliable, sleek, etc etc. yup..i am experimenting with it. thanks! Thanks! if ur a music freak, then u wud love iPod or the like of it. yes. I can see the craze here.. everone on the rooad carried some type of iPod. 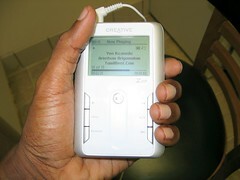 Chose Creative for teh Performance, though I like iPod. Yeah… all opinions r welcome in this blog… even i like iPod. Chose creative for battery performance- also it looks decent. >I know the joys of owning one of these cool MP3 players. I have a Dell DJ. 24 hours playback time is really cool! I have heard a lot about this Zen player, let us know how you like it. It’s cool. Already loaded with 2GB of songs. I’ll fill it when I get back to Chennai :). Even Dell DJ looks good.. Previous PostPrevious What kind of blogger are you? Next PostNext India and the nerd world..
Oru Kodi: Vijay TV’s big gamble?